In the late 1930s, as skiing became a national pastime, Laramie boasted a variety of local ski areas. Summit Tavern and Happy Jack were east of Laramie while Inspiration Point, Libby Creek and the current Snowy Range Ski area were located off Highway 130 to the west. Rental skis were not available. You either owned a pair of skis or borrowed them. 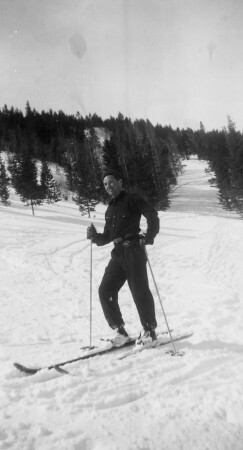 According to Judy Knight, a volunteer at the Laramie Plains Museum in her article titled “Origins of Skiing in Albany County,” investors from Kansas City signed a 30-year permit in 1959 with the Forest Service to operate a ski area at Nash Creek, which was originally called Medicine Bow Ski Area. It opened for the 1960-1961 season with two T-bars, a restaurant and warming lodge. Although it has changed ownership since then, it is now known as the Snowy Range Ski Area and is still a favorite place for local skiers and snowboarders. Learn more about the history of skiing and skiing today in Albany County.